Sora’s Teammates photo mission in Kingdom Hearts 3 is a task you can take from the Moogle Shop. As the name implies, it requires you to take photos of all of Sora’s teammates in Kingdom Hearts 3. Most of these are obvious, but a few of them might be a bit harder to figure out. So, with that in mind, here’s our Kingdom Hearts 3 Sora’s Teammates Photo Mission – How to Complete guide to hopefully help you out, by showing you exactly who you’re supposed to photograph in each world. 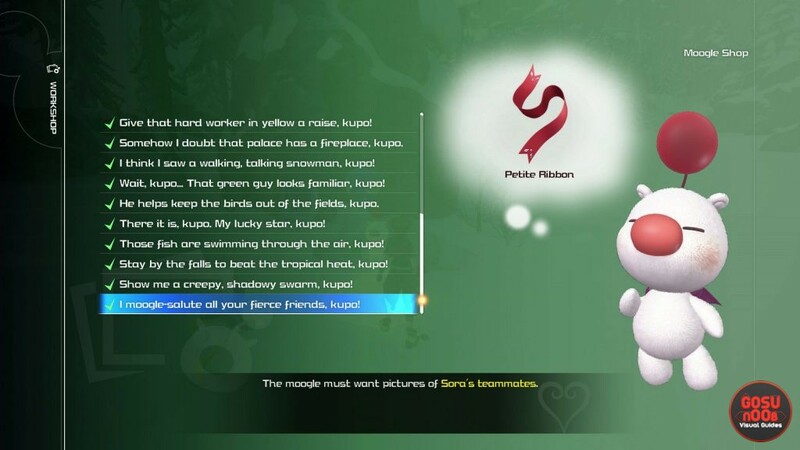 KH3 Moogle Photo Mission – Where to Find All 12 Sora’s Teammates? The first two teammates are the most obvious – Donald and Goofy. You can take their picture anywhere you want. We’ve opted for taking their pictures in Toy Box, but that was just a matter of convenience. Pick which look of theirs you prefer, and take the picture there. Each teammate you take a photo of will strike a pose when you point the camera at them, but you don’t have to wait for that. Just put them in the center of the shot and take the photo. Next up, there’s the teammate in Olympus, which is, of course, Hercules. Simple enough. Then, we go to Toy Box. Your teammates there are Woody and Buzz. Our next target is the Kingdom of Corona. The most obvious teammate here is Flynn, who will be at your side at all times. Rapunzel might not be as easy. She won’t be following you around after you’ve completed the main campaign portion of Corona. After that, she’ll be standing in the central part of the festival, in the place where you play the dancing minigame. Getting close now; we’re over halfway there. Head over to Monstropolis. You’re gonna have to take a picture of Mike Wazowski, and then Sully. After you do, there’s only three left; one in each world. We’re gonna group the final three teammates here, because Arendelle, San Fransokyo, and The Caribbean each have only one teammate for you to photograph. In Arendelle, it’s Marshmallow, the friendly snow monster. In Fransokyo, it’s Baymax, the marshmallowy robot in red armor. And, lastly, in The Caribbean, it’s none but Jack Sparrow. Excuse me, captain Jack Sparrow. So, that’ll complete the Sora’s Teammates Moogle Photo Mission in Kingdom Hearts 3. You’ll get a Petite Ribbon for your troubles. Equipping it gives you a small boost to Defense, as well as a 20% bonus resistance to all effects: Fire, Blizzard, Thunder, Water, Aero, and Dark. If you need help with another Moogle task, take a gander at our other Kingdom Hearts 3 Photo Missions guides, including Where to Find Demon Tower Photo Mission, Big Beasts & Bugs Wall Display Location, and Festival Picture Photo Mission – How to Complete. God dammit no wonder. I’ve been wondering how the hell I was supposed to get pictures of Mickey/Riku/Ventus/Aqua/Roxas/Axel/Kairi/Terra/Xion and who the 12th even was. I didn’t even think of the world based teammates. I feel stupid. Regardless, this list was exaclty what I was looking for. Thanks! Oh my god, I can’t believe I actually wrote Betamax! Thanks for pointing that out!